High Alemannic is a dialect of Alemannic German and is often considered to be part of the German language, even though it is only partly intelligible to non-Alemannic speakers. 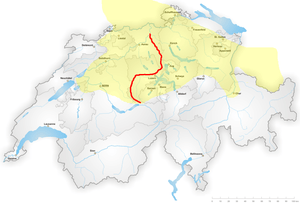 High Alemannic is traditionally subdivided in an Eastern and Western language area (Sprachraum), marked by the Brünig-Napf-Reuss line isogloss crossing the Swiss cantons of Aargau and Lucerne (Luzern). Eastern High Alemannic (for instance Zurich German) and Western High Alemannic German (for instance Bernese German) differ in pronunciation of diphthongs and in pluralization.